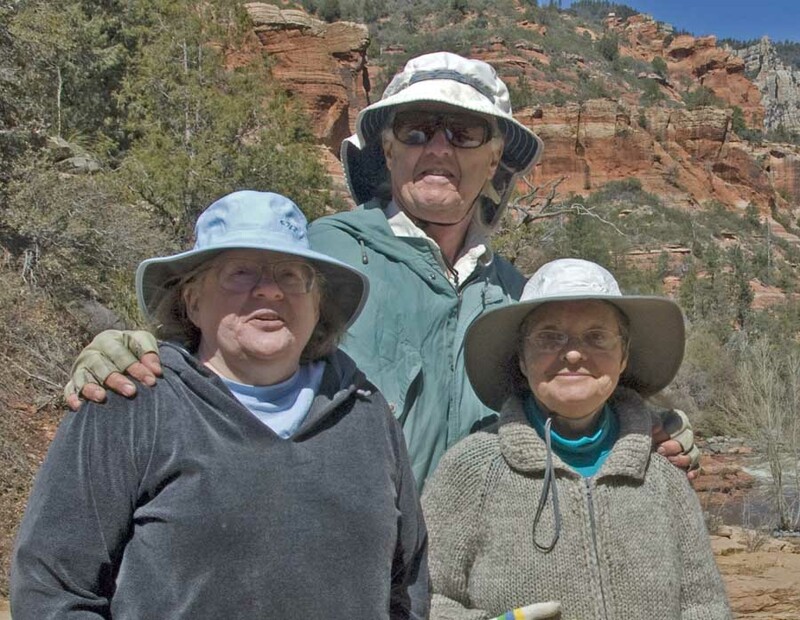 This spring, Helen and I, with Judy Warner (formerly a graduate student of mine and Helen's and a research assistant to Helen, now a Professor of Sociology at Texas A&M International in Laredo TX) decided to explore the more easterly portions of the Colorado Plateau in Arizona. Last year we wandered the more western, Grand Canyon-Zion-Bryce portions of this Plateau, see 2009 July Geological Trip for access to that series. I should say here that none of us qualifies in any way as a geologist, but when I see remarkable landforms I find myself driven to wonder what they mean and I find the most compelling answers in geological knowledge. Hence I struggle to make reports like this, knowing that geologists themselves often disagree and that my own grasp of the subject will never be more than a folly of starts and stumbles. Still, I persist; if you enjoy follies, read on. Or just scan the images, many of which I assure you are very beautiful entirely of themselves. 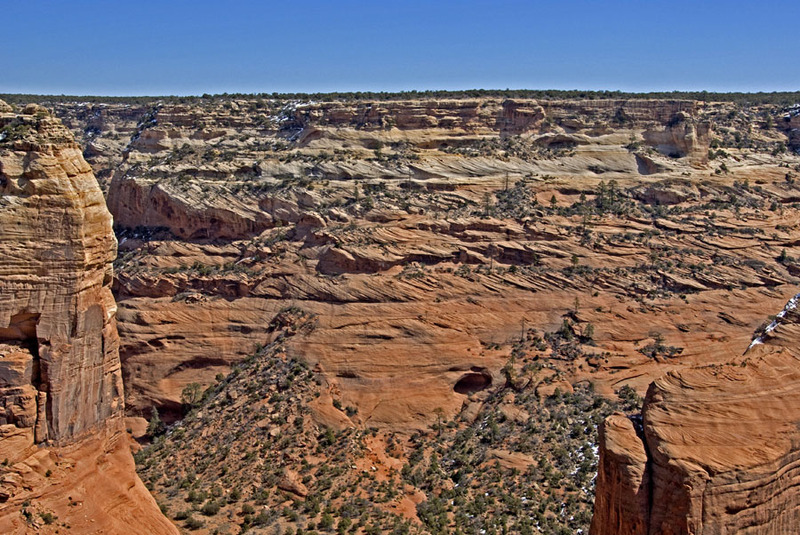 The Colorado Plateau is a huge and very distinctive geological province in North America. Overall, it averages around 6,000 feet in elevation, mostly rather flat-lying with mostly sedimentary rocks covering the surface, largely undeformed (in contrast to the Basin-range province to the west and southwest and the Rocky Mountains that bound it on the east, which are much more strongly deformed by tektonic forces). This suggests great stability over time, though sedimentary layers now found at 6,000 feet or higher were deposited at or near sea level, which means that the entire area has been raised (and lowered) as a unit over time to considerable extent. Thanks to Blakey and Ranney (2008: p. 126), we have a fine map (below) showing its full dimensions, ranged around the four-corners area. 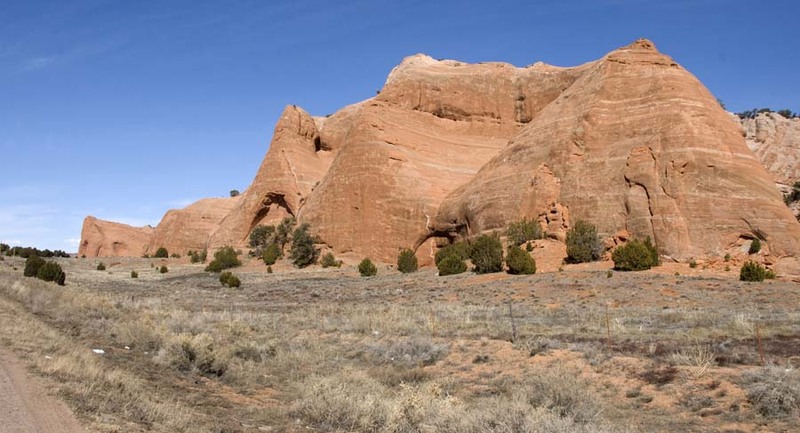 This time we decided to tour the south-central part of the Plateau, from the Petrified Forest to Canyon De Chelly (and surrounds) to Sedona. So on the Ides of March, we departed Tucson (not shown on the map above, but you can see the Catalina-Rincon Mountains complex right at the bottom of it, directly below the "A" of "Arizona"), and headed (in Diana Wilson's and Arni Sveinsson's Nissan Questa, a more commodious vehicle than our Prius) for Holbrook, where after a long drive we spent the night. 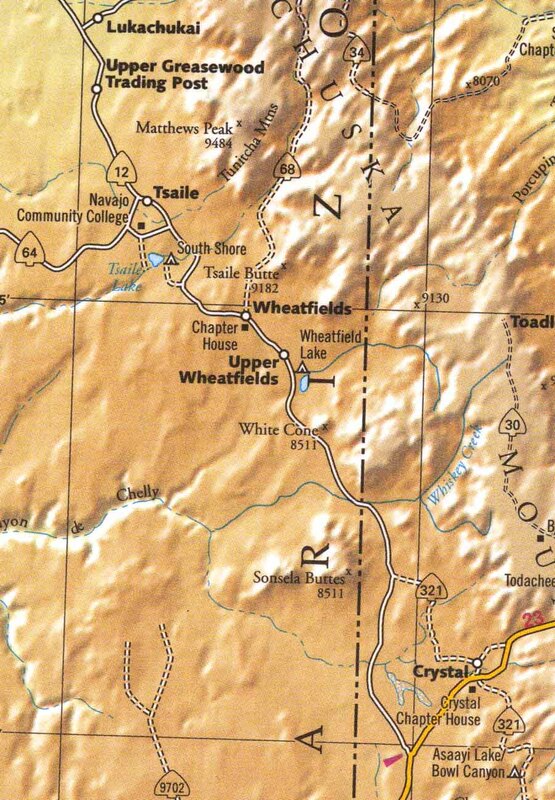 On the map above, Holbrook is located a short distance left of the point marking Petrified Forest National park, and along the red line showing US Hwy 40 running roughly West-East in this area. 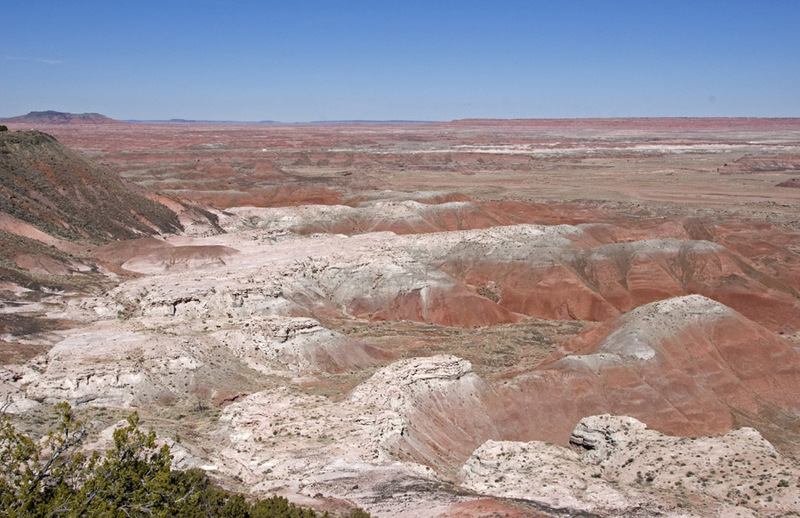 Next morning we had only a short drive to the Petrified Forest National Park, which falls almost entirely within the eastern end of the Painted Desert, the land coextensive with the Chinle Formation, layered sedimentary rocks of the Middle Triassic Period (ca. 240-209 million years ago). 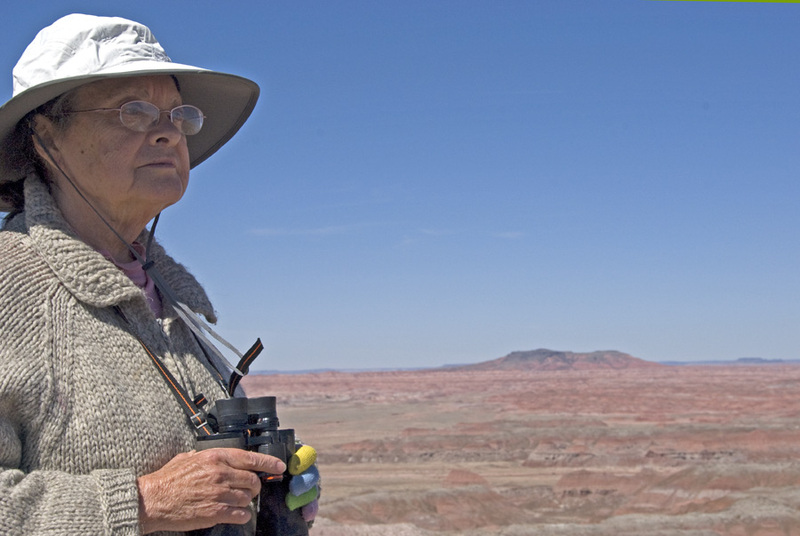 Below, Helen stands on a point overlooking a portion of the Chinle (the banded red-pink-white layers in the background). 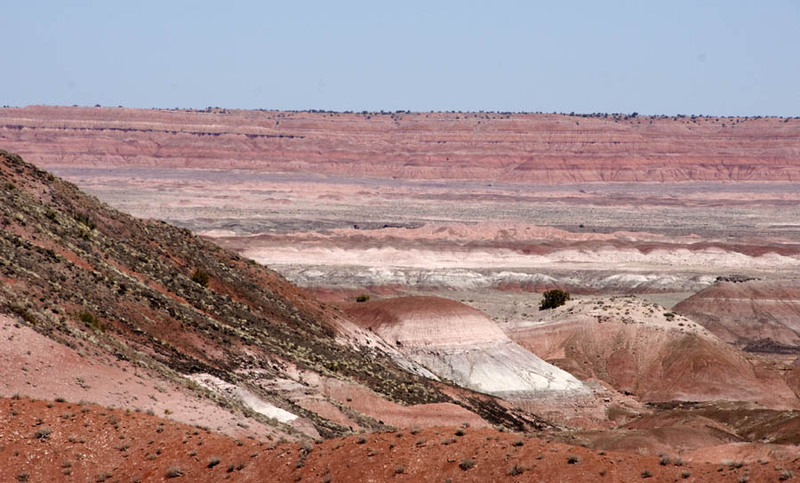 Below, a white layer rides above more pinkish and reddish layers. The darker material at left and also above is associated with a volcanic capstone of much more recent origin. 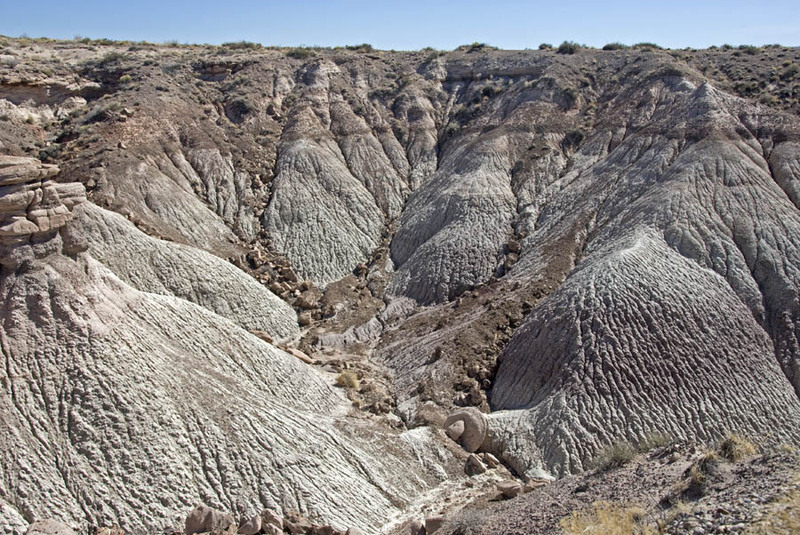 Because of its extreme softness, Chinle layers tend to erode in a conical manner (approaching the angle of repose attained by sand piles, for example, but the Bentonite gives them enough "glue" to round the cones), as seen below. Note the blue tones in the middle layers of these "tepees" (here slightly tone-intensified to make them easier to see). 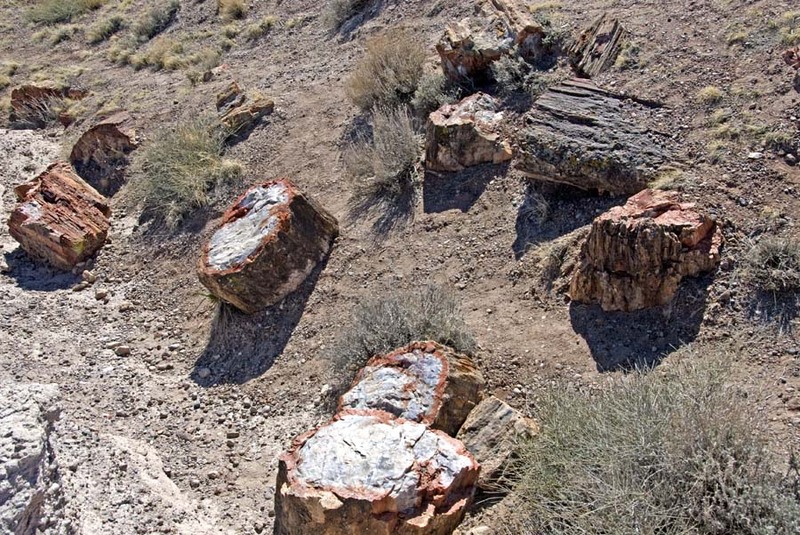 Below, various grayish layers often contain petrified wood, even nearly entire trunks of various trees from the Middle Triassic swamps and rivers which produced and then killed them. 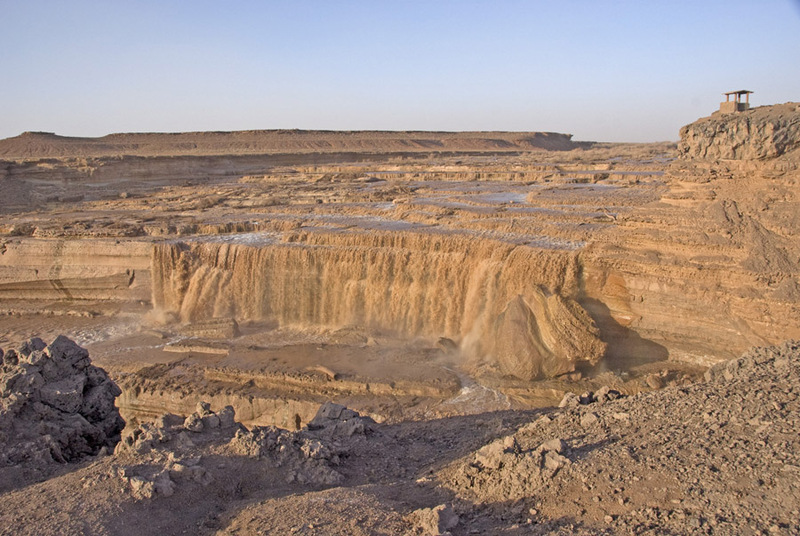 Note the very typical rounded-cone character of these erosions, with distinctive flow-marks, which are due to the strong tendency of the Bentonite to swell when it becomes wet, then shrink as it dries. Note also the blocks of stone lining the bases of the erosions. 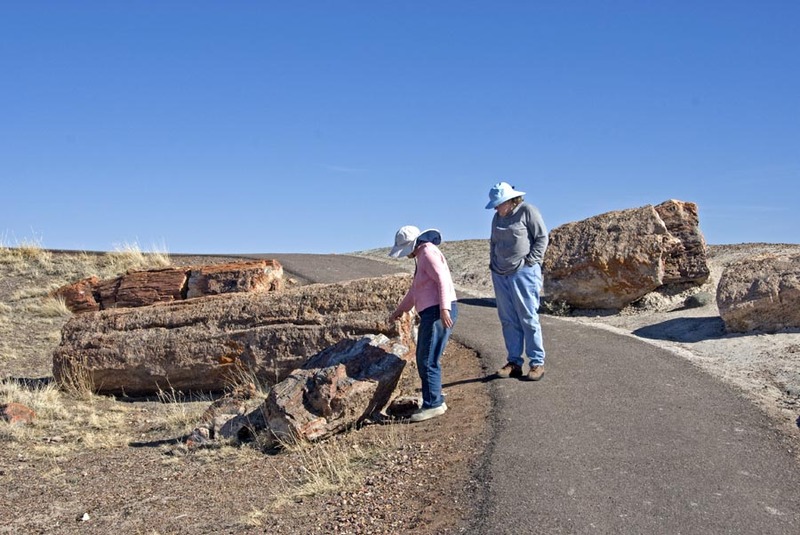 Many if not most of these are blocks of petrified tree trunks, which appear to have fallen as whole trees at the time of their deaths, but eventually break apart by gravity when their enveloping support is lost. The matrix containing these petrified trunks below is nearly (but not quite) eroded away. When it does, they will fall to the desert floor (and break apart further). Below, a close view of some long-dead portions of tree trunk. These present a wide variety of colors, purple and violet from iron and manganese, green from copper, uranium, nickel etc, gray and white from the pure silicon dioxide, blue from copper, cobalt, chromium, etc; black from carbon, iron, manganese combinations, yellow from iron and uranium, orange and red from iron. These were transferred into the dead logs as Bentonite solutions and the chemicals gradually replaced wood cellulose cell by cell. Or consider this specimen, infiltrated by a kaleidoscope of mineral-containing solutions. 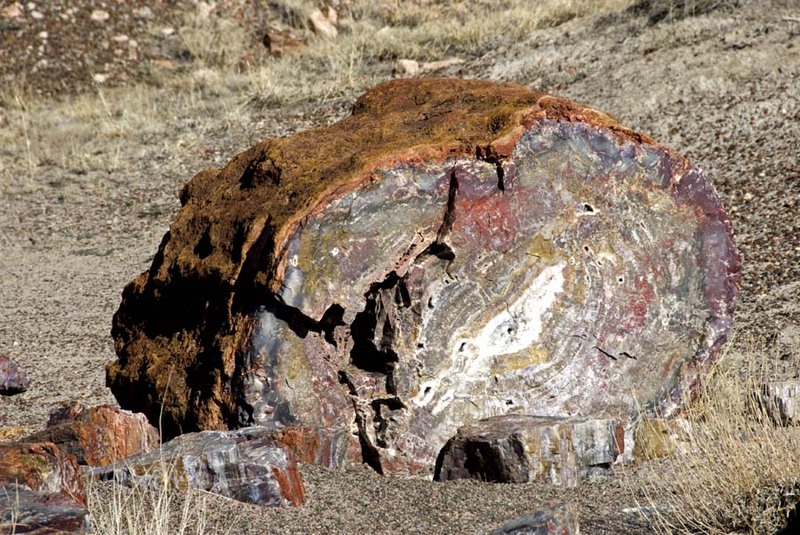 This specimen also retains its bark, a rarity in the Petrified Forest. 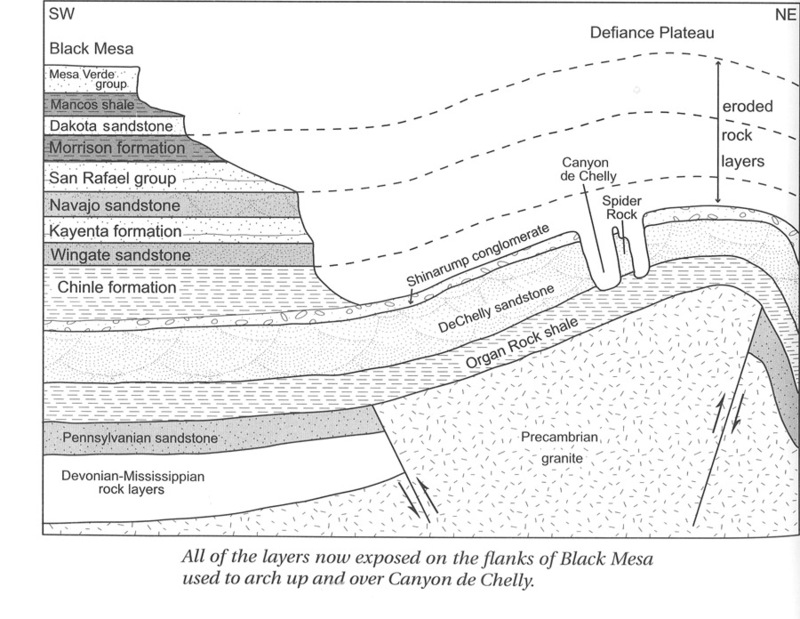 Blakey and Ranney (2008, p. 128) summarize the formation of "the world's greatest concentration of petrified logs" in this part of the Chinle Formation as follows: "Volcanic eruptions from the south and west created havoc in this subtropical river system and may have actually killed the trees when they were inundated with layers of wind-borne ash. The dead trees fell into the streams during floods and were brought to their present resting place within the modern park as giant logjams. Continued volcanic eruptions quickly buried the logjams, preserving them from decay and also incarcerating them within layers of silica-rich ash. The silica molecules released from the decomposed ash grew within voids in the wood and ultimately turned the logs to stone." Abbott and Cook (2007, p. 207) provide this map below for Chinle geography of the Middle Triassic 240-225 million years ago. The combination of ancient lakes, swamps, and meandering river and streams, together with an indication of volcanoes to the south as a source of ash falls (though the existence of these volcanoes at that particular location and this early in time is uncertain; they may have been part of an offshore marginal arc) is what produced the outcomes we wonder at today. Below, a map from "Paleogeography of the Southwestern US" [see paleogeogwus.html] (The red dot marks the location of the Four Corners.). 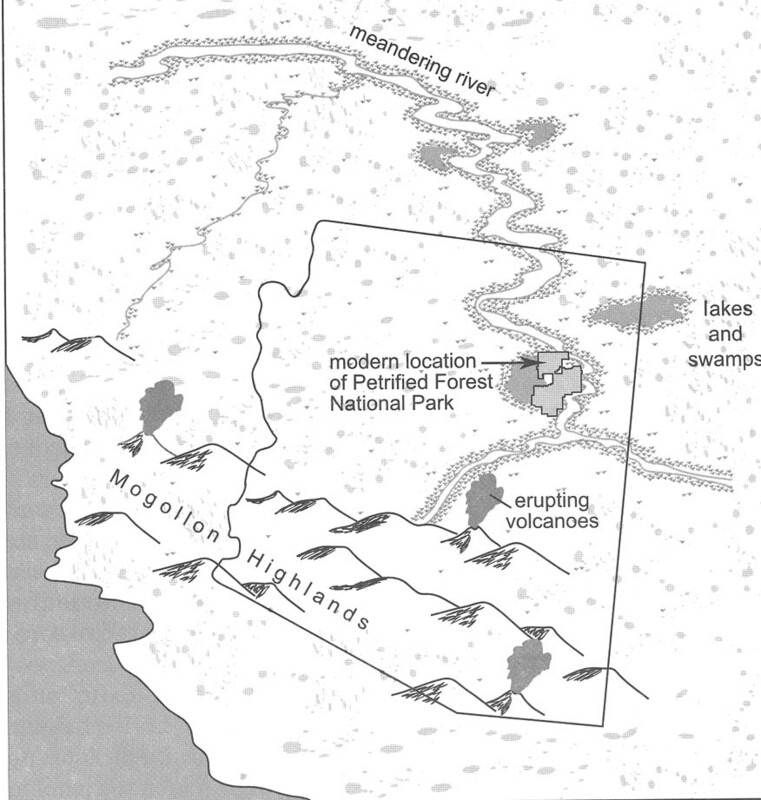 This map suggests the geographic situation during the deposition of the Chinle Formation, a time of lakes and meandering rivers draining from the southeast (some from as far away as the southern Appalachian mountains) and into the sea in what is now Nevada, forming swampy forests along the way. 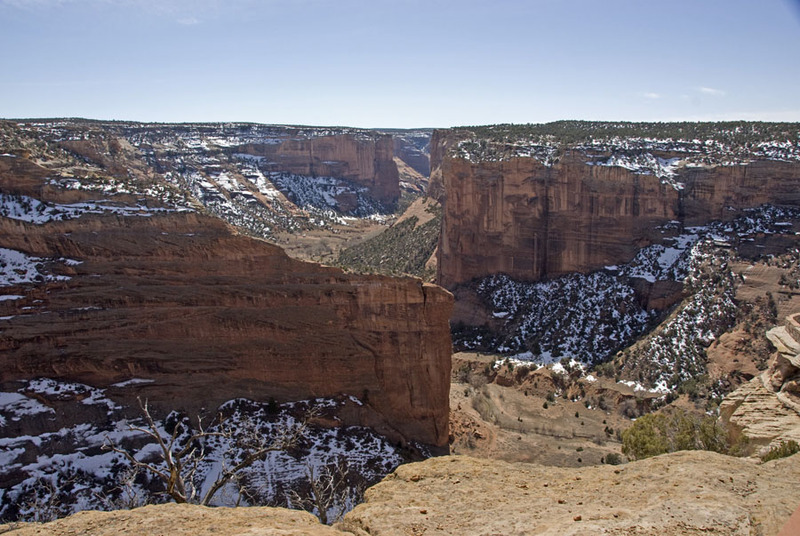 An important fact of the Colorado Plateau is its physical stability over very long periods of time: parts of the region might sink below sea level or rise above it, but it tended to remain level from the early Cambrian period of the Paleozoic era (525 million years ago) until near the end of the Mesozoic era (70 million years ago) and in some places much later than that. Because of the physical flatness of the land, slight changes in elevation could cause seas to enter the area, or leave it, repeatedly. The forests lining and to some extent filling these swamplands persisted over long periods of time and were populated with many kinds of trees and animals. 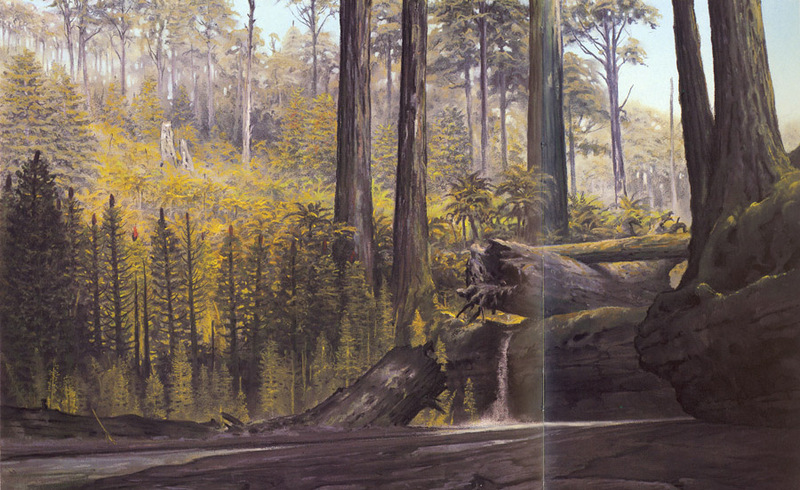 Below, an artist's reconstruction of a Mid-Triassic forest, including not only stately conifers but also giant horsetail (equisetum) trees, shown here at lower left (today their surviving relatives reach only a foot or so tall). 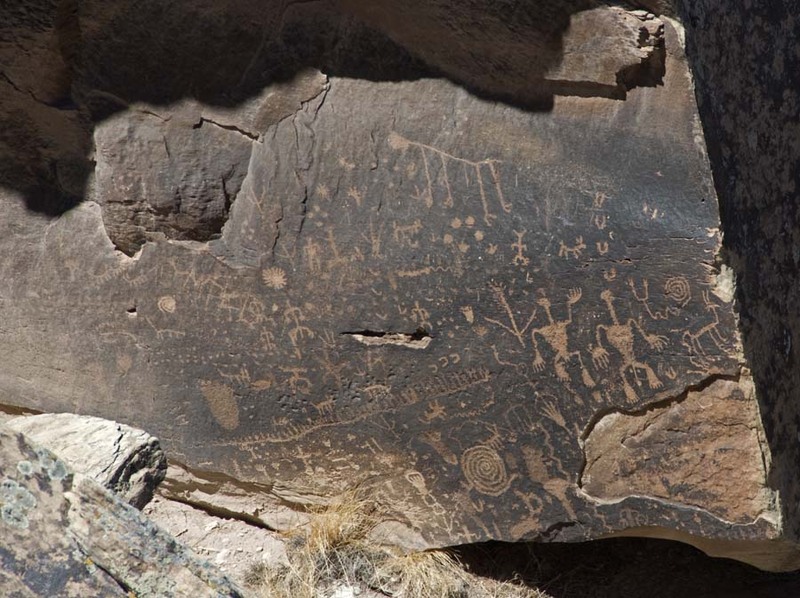 These are found among the petrified forest's remains. 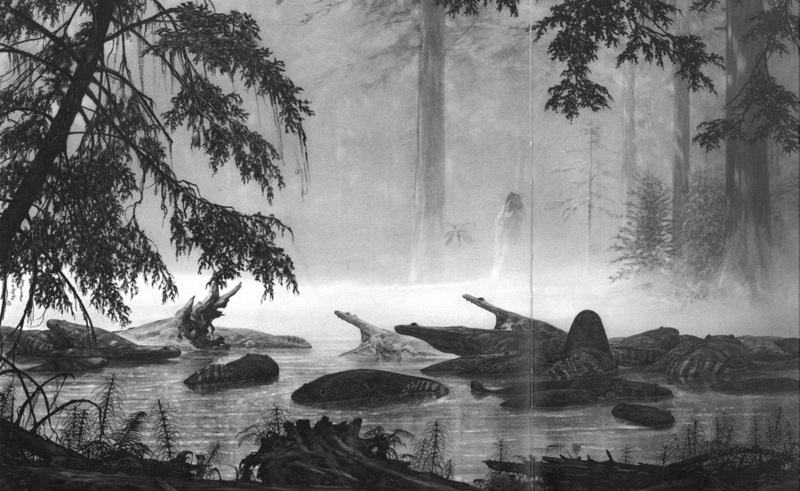 Below, an artist's rconstruction of a population of Chinle metoposaurs, giant early amphibians (reaching 40 feet in length), shown lying in their swamp lair waiting for prey. 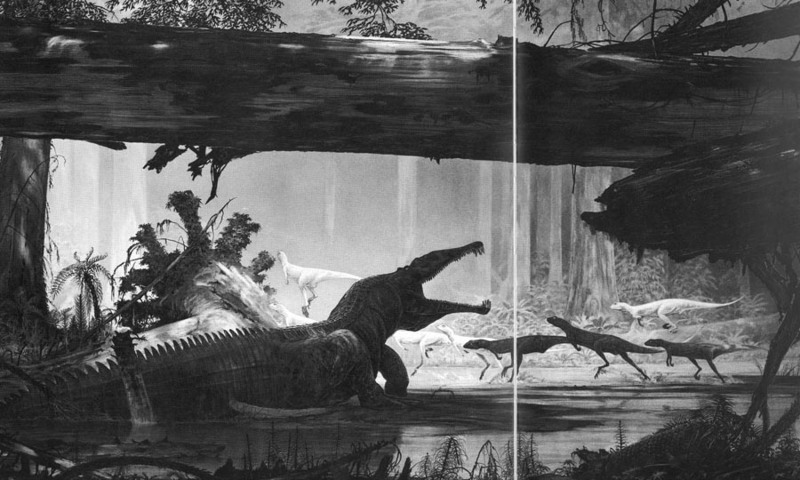 These habitats also hosted phytosaurs (large, crocodile-like dinosaurs) as well as such early raptorial dinosaurs as coeolophysis (running across the image below at the rear). 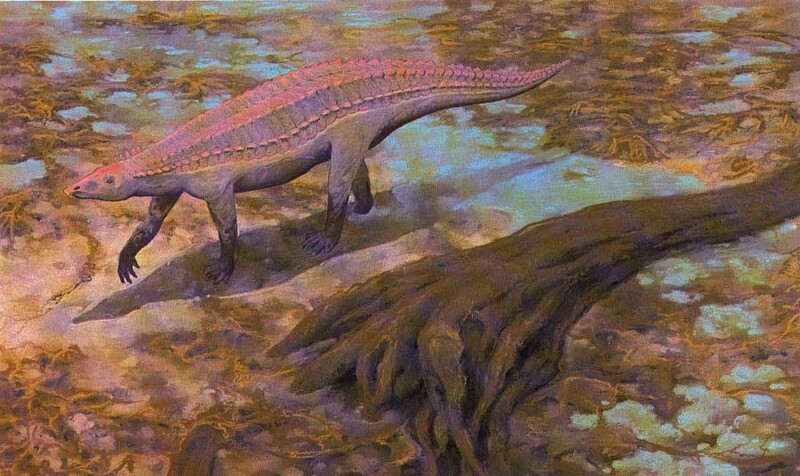 Early armor-plated herbivorous dinosaurs, such as the aetosaur shown below, were also present here in Chinle times. 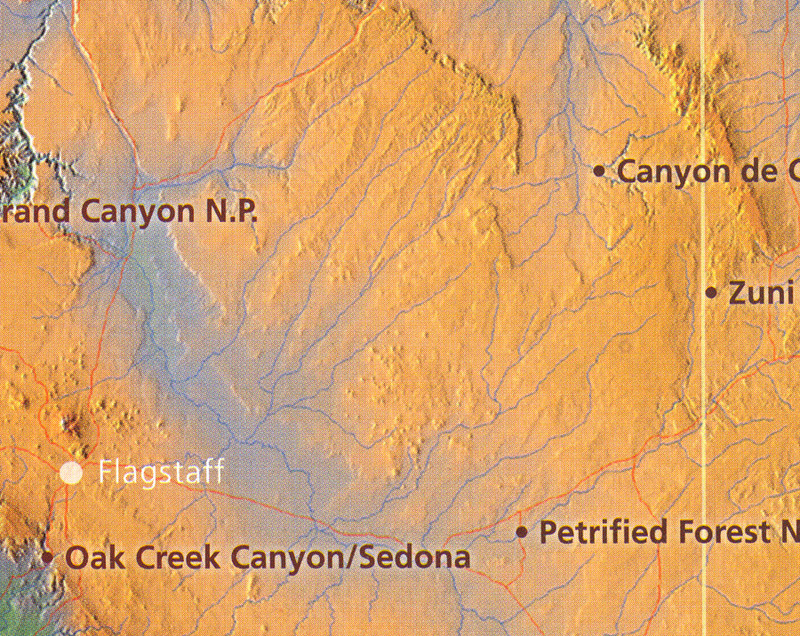 This detail map of the Colorado Plateau below shows the topography of the area we next visited, centered at Canyon de Chelly. 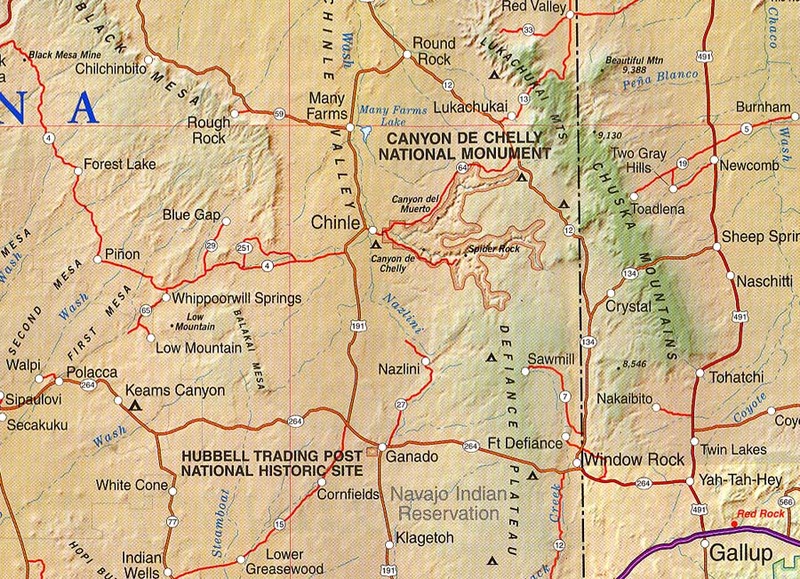 Note that the Canyon cuts upstream eastward into the chain of higher mountains to the east (the Chuska range), part of an upland called the Defiance Plateaur which is separated from Black Mesa (marked here by the escarpment running north-south directly west of the canyon) by the north-flowing Chinle Wash (which drains all of this northeastern corner of Arizona into the San Juan River of southern Utah [see the map at the top of the page]. 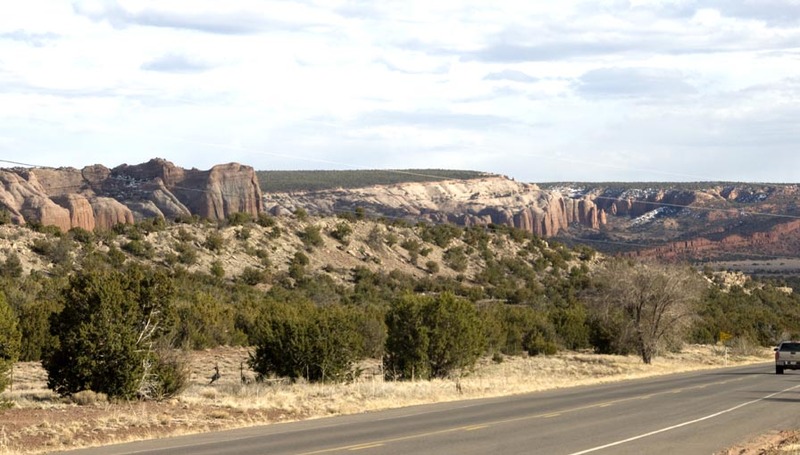 We took US Hwy 191 north through Ganado (see map below), then on to Chinle, mainly atop much younger sedimentary rocks, but near Ganado we again road Chinle Formation while we saw views of the cliffs of the southern Defiance Plateau far to the east and the glories of the Beautiful Valley in between (no photographs, though), formed by the Nazlini Wash. The "Defiance Plateau" label applies to this whole northeastern corner, as we shall see. When we neared Chinle we again encountered the Chinle Formation (though here we began riding on its oldest (basal) member, the Shinarump Conglomerate (Early Triassic, 230-210 million years ago), a harder sandstone containing innumerable scattered, rounded pebbles very different from the crumbly later Chinle mudstone we had seen as Painted Desert (most of which has eroded away from this higher part of the Plateau, which it formerly blanketed). We stopped at the town of Chinle, and toured the south rim of the Canyon in late afternoon Wednesday, March 17. Here below you see mainly the darker Shinarump Formation of the Triassic period as the canyon's capstone (it forms the surface rock everywhere in the Monument) lying at the top of an older and lighter pink layer of sandstone now exposed by the Canyon, which is appropriately named the de Chelley Formation. This older (earliest Triassic) layer is composed of cross-bedded sandstone deposited as wind-blown sand dunes in many layers between 250-230 million years ago. 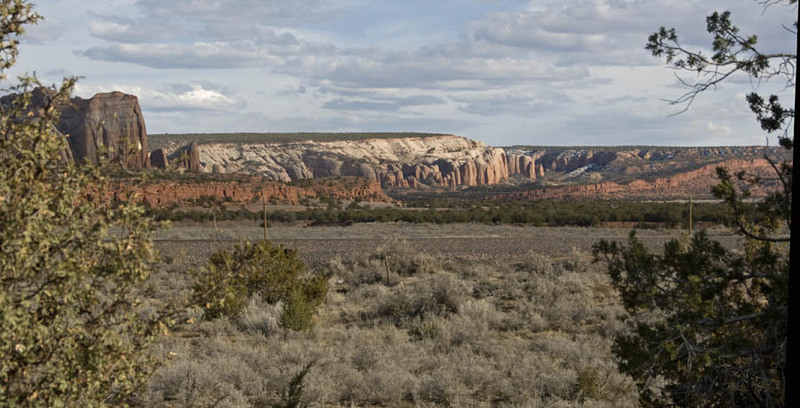 Note also in this image, far to the west, the silhouette of Black Mesa, the other side of this portion of the Colorado Plateau, which has experienced a very different fate from this eastern end, yet is geologically connected with it. See further below. Still on the south rim on March 17th, we went further up the canyon to the viewpoint of the "Whitehouse" ruin. See it far below at the base of this image. (Also note that the Shinarump Formation appears very clearly here at the top of the cliffs.) 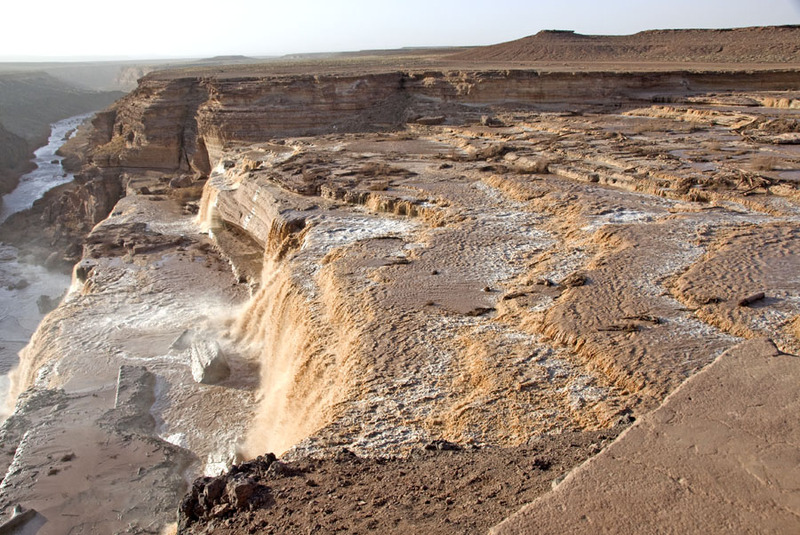 Note also the dark streaks of "desert varnish" running down the vertical cliff face, resulting from a rain-wash flow of manganese- and iron-containing silica-rich clay, some of which sticks to the rock. Biological materials become trapped in this material, which becomes quite hard and may last for thousands of years. Below, a zoom view of the ruins, in the base of the canyon. 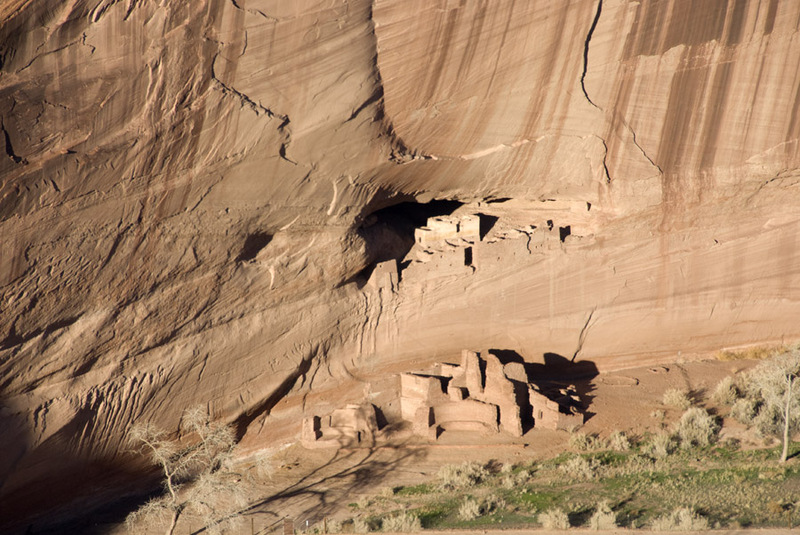 These pueblo ruins date from about 1200 A.D.
Below, the de Chelly Foremation viewed in greater detail, now from the north rim on the following day Thursday March 19. It's hard to imagine the time span involved in the deposition of these layers upon layers upon layers of wind-blown sand (some 20 million years, and more). 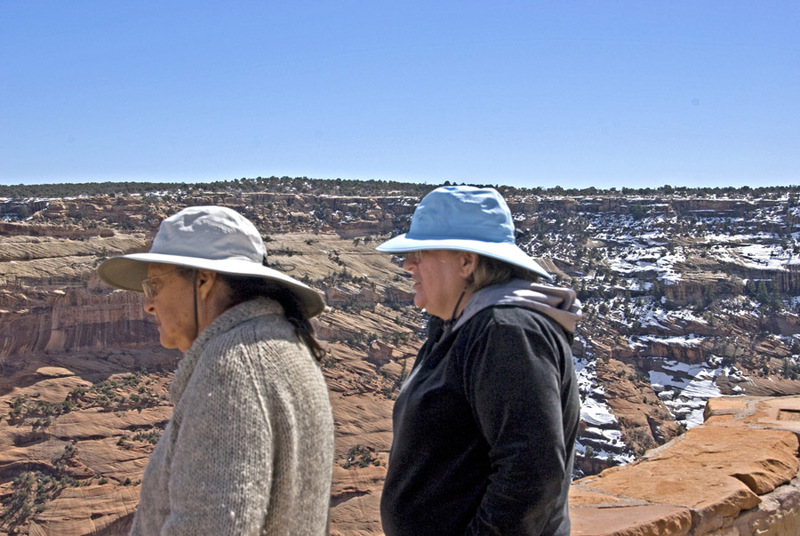 Below, Helen and Judy look at another ruin far down at the base of these cliffs. Returning, then, to the subject of Black Mesa's relationship to the Canyon. 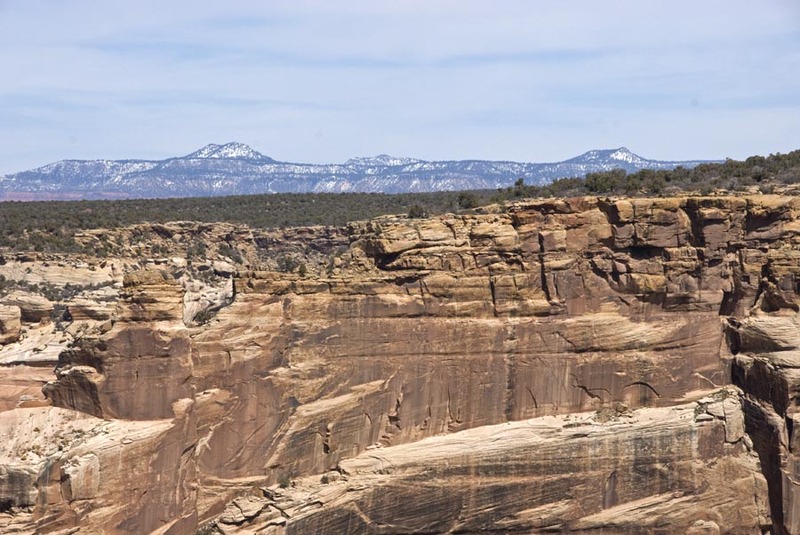 Both sides are part of the ancient Colorado Plateau, which received the layers upon layers of sedimentary deposits documented in this region, very prominently including the Grand Canyon. 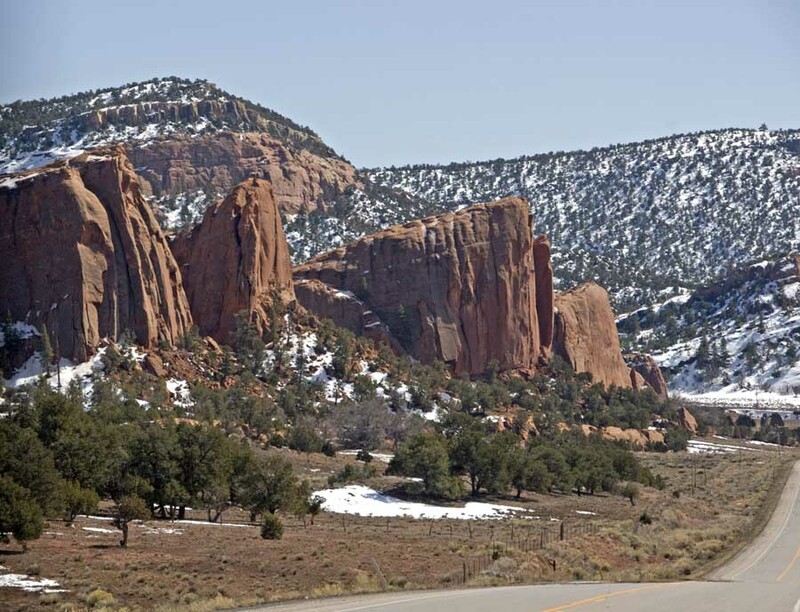 But while Black Mesa (at left below) remained a relatively flat, stable member of the plateau as it was uplifted at various times, this region to its east, now called the Defiance Plateau and the process the "Defiance Uplift"experienced a very substantial "monocline" uplift, most notably during the Laramide mountain-building time between 70-40 million years ago, but also earlier during the Paleozoic era and perhaps over several different times): [diagram from Abbott & Cook 2007, p. 126] Therefore Black Mesa, which now looms high over Canyon de Chelley, is structurally a basin relative to the ancient uplift whose remnant rocks we now stand on (and geologists so call its area). 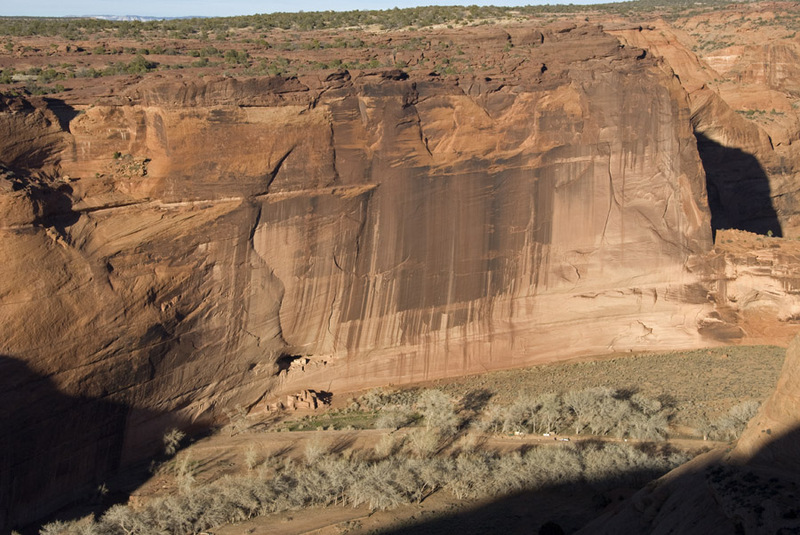 This monoclinal uplift (involving a fault moving one side of a formation upward while leaving the other flat) led to monumental erosion of the Defiance Plateau, culminating in the sight we see today from the rim of Canyon de Chelly: a Black Mesa standing much higher than we are but composed of much younger rocks at its top. 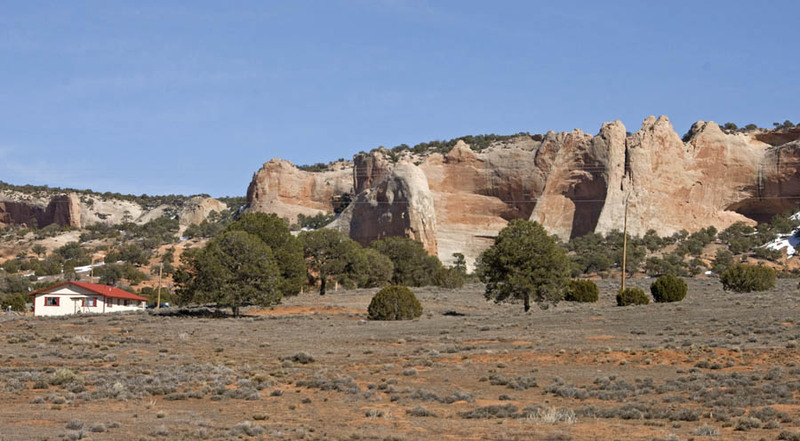 The map below shows you the central part of our route as we dropped down off the highest part of the Canyon de Chelly rim area to Indian Road 12. (We stopped briefly at Dine College, the Navajo Community College near Tsaile, a remarkable complex of buildings and operations.) 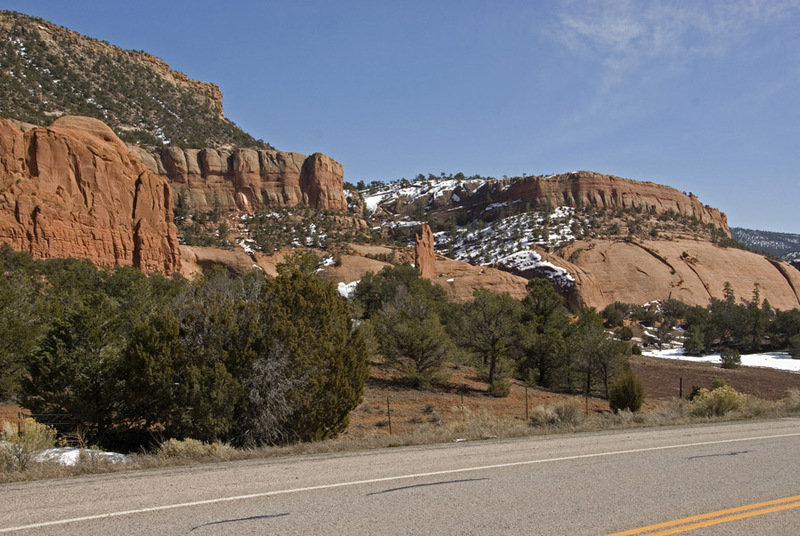 From there as you can see we drove along valleys southward, with escarpments tilting upward toward us on our left and upward-tilting escarpments (of the Canyon de Chelly portion of the uplift) tilting away from us to our right. 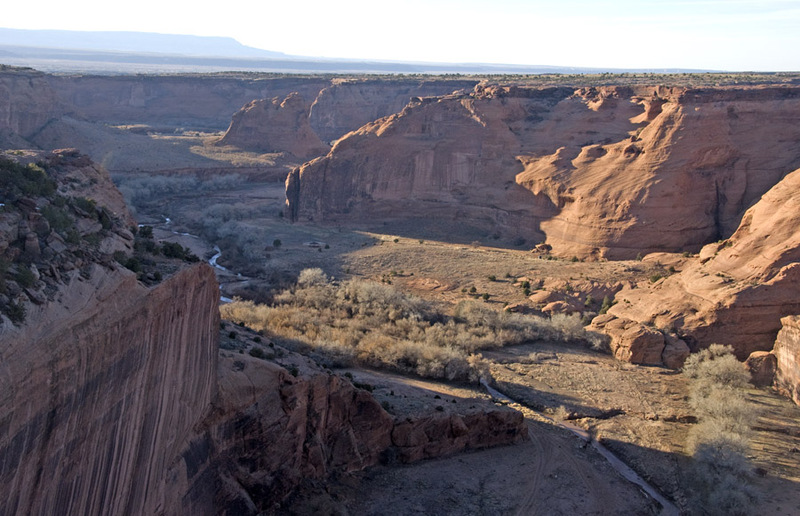 Though the Canyon de Chelly formations to our right were interesting, what visually overwhelmed us were the Chuska hogbacks facing us to our left. It was a jaw-dropping experience, and at first where I was driving you couldn't stop when you saw spectacular scenery, so for the first portion of the journey we have no photos. Then the road opened up a bit, and here are some images below. 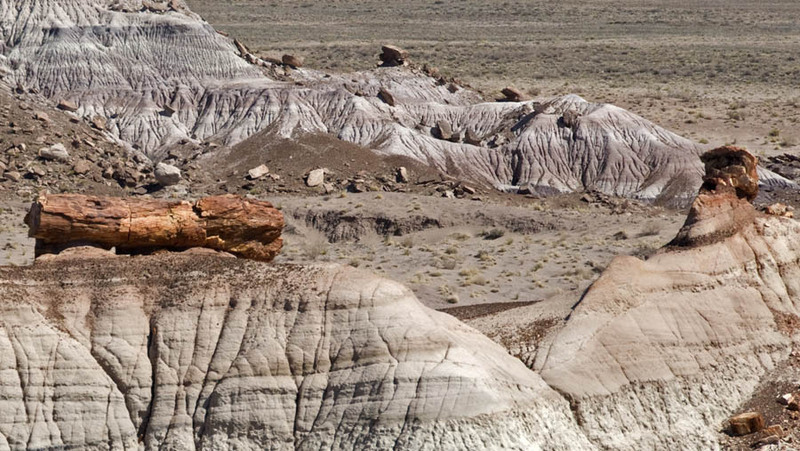 We aren't exactly sure of where these images were taken, but we think they represent, at different points, upward-tilting (toward the west) Jurassic sandstones (205-130 million years ago) and/or Triassic sandstones (240-205 million years ago). In any case we were viewing the eastern hogbacks of this uplifted portion of the Colorado Plateau, and for the rest of the way we surely rode in beauty, enroute to Winslow where we stopped and saw in the dark of night an extreme opposite, a downtown streetway that gave an impression of improbable dereliction. We were happy to find the Casa Blanca Mexican Restaurant nearby, a beam of light and life in a darkling relic of a place (aftermath of the I-40 Bypass of Routet 66 and changes in railway operations?). In this last picture below, you see clearly the railroad bed that parallels US. 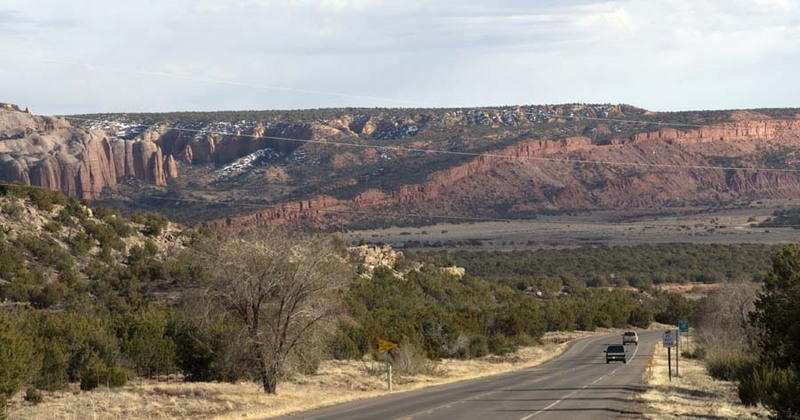 Hwy 40, marking the end of our Chuska Mountain rollercoaster ride, but as you can see these Colorado-Plateau-edge formations continue on south, out of sight. 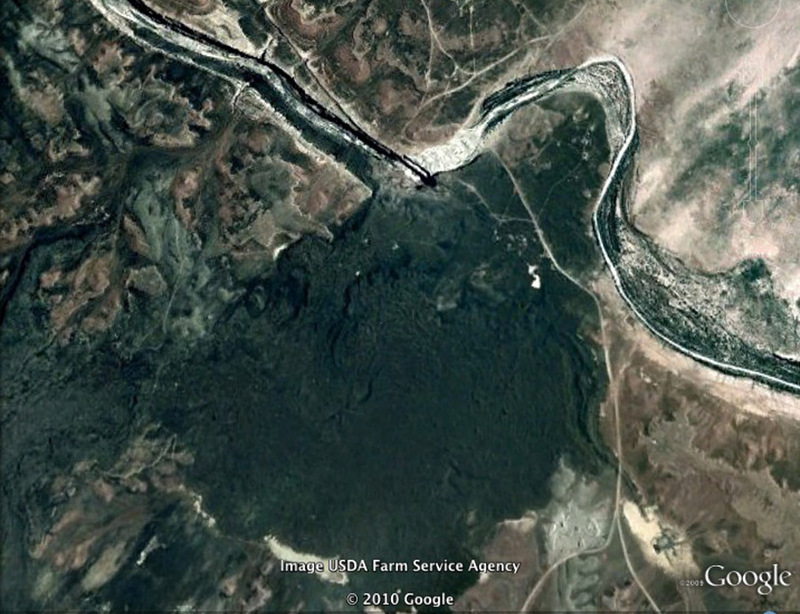 Below (thanks to Google Earth), a satellite image closeup of the falls location, showing where the two indian agency roads meet at the bottom then strike on northward. Where the road turns to rise up on the lava, at that point the river and the road are at about the same level (the main part of the river channel there is the broad white line). The area of the Falls is the bright white, broad slash at mid-photo toward the top. Below, a stronger view down the canyon below the falls. The intruding lava flowed some miles downstream in the canyon here (though at a lower level than the old canyon), and has since been considerably eroded. 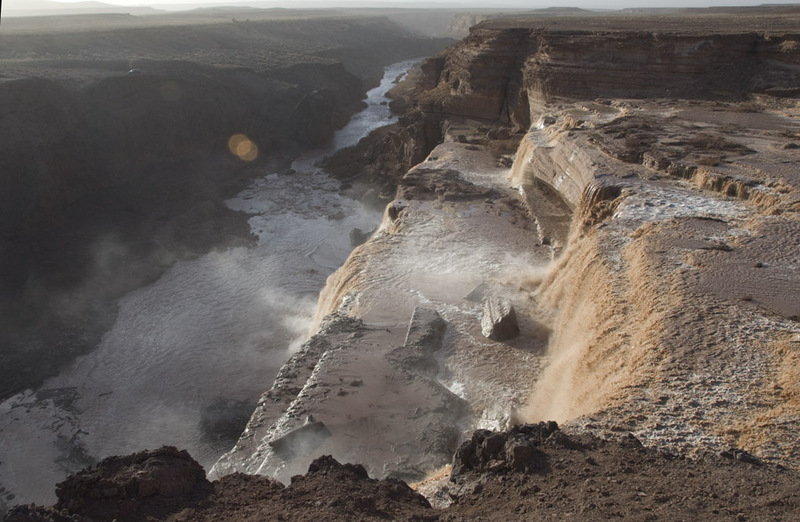 Recent dating indicates that the entire basalt lava flow occurred in late Pleistocene time, some 20,000 years ago, when it flowed about 6 miles from its vent area to the Little Colorado River, cascaded into and filled a 180-foot-deep canyon to form a dam. 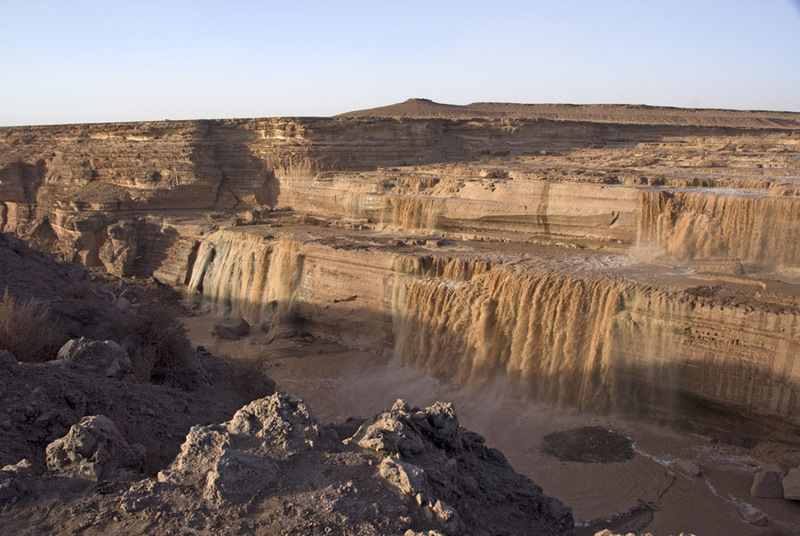 A reservoir formed behind it, until that filled, and the river then flowed around the northern margins of the dam, eventually falling back into the pre-eruption canyon. There were about a dozen cars out there when we arrived in the late afternoon, and those we spoke to said they've never seen the falls running like this. Here is a final view, showing numerous rock-layer terraces above the main drop of the falls. 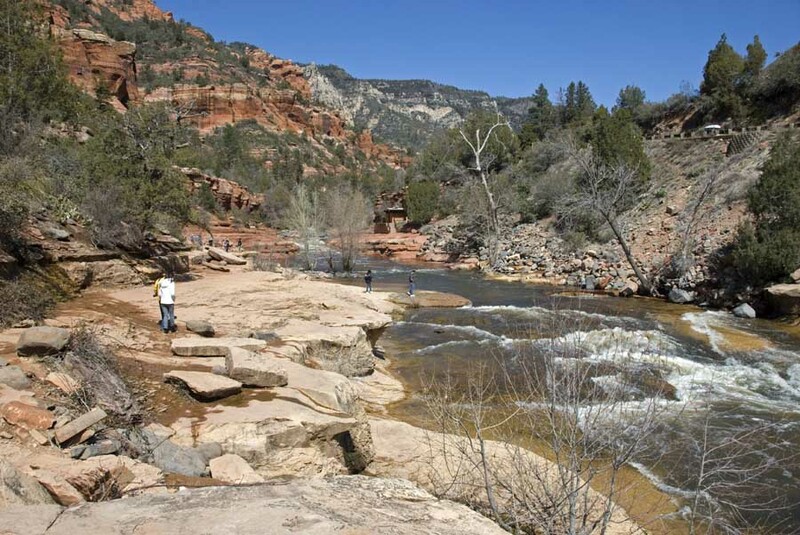 after staying overnight at Flagstaff, we drove south down US Hwy 89A along Oak Creek, stopping briefly en route at the Slide Creek State Park. 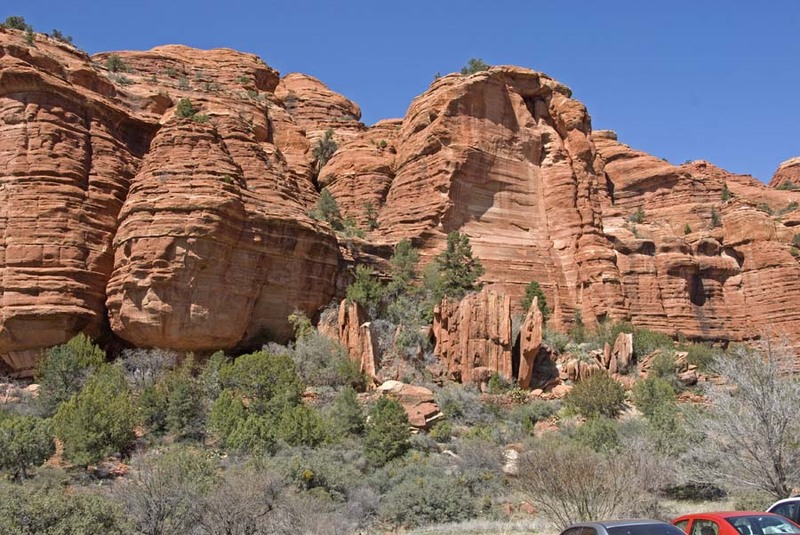 We then drove through Sedona and on to the Pulatki Ruin (hidden behind shrubs and trees in the image below, at lower mid-left. What follows below are a series of images for this area, then I'll return briefly to geology. The next image shows rock formations near the Pulatki cave complex of ruins, which is visible at mid-left just below the red rocks. 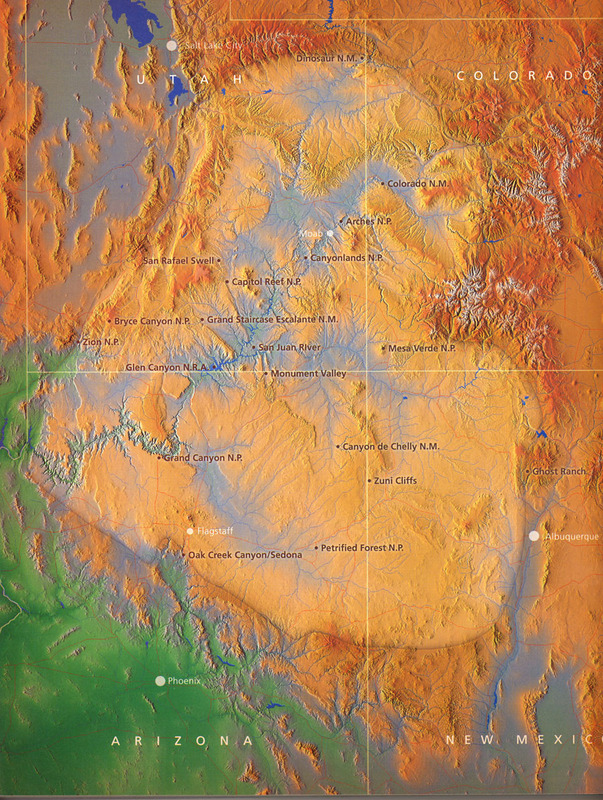 About 15 million years ago, the entire topographical relationship became inverted, when the Basin-Range process of crustal extension caused what was left of these old "Mogollon Highlands" to collapse into much lower elevations, leaving the Colorado Plateau (and the Mogollon Rim) higher, while the opening of the Gulf of California produced a realignment of drainage to the south and west through the Colorado River (and its Grand Canyon) with the Gila River system flowing westward into it as well. 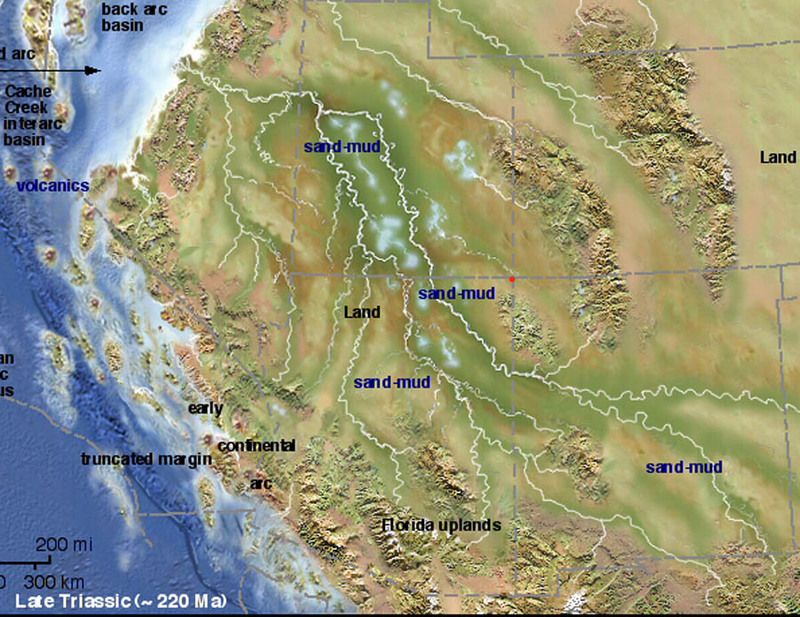 Thus geologists have identified a great mountain system, once extending from the area near Las Vegas through Phoenix and Tucson but which no longer exists, knowable mainly through evidence from such deposits as "rim gravels". Finally, we returned to Tucson by way of Winkelman AZ, a mining community we reached in pitch-darkness, only to see a huge ball of fire rising suddenly out of pitch-darkness into the sky above one of the slag hills. We rushed to stop and get out the camera, but the fire quickly ended and we realized it was a truckload of molten slag just overturned on the edge of a terrace, which burst into flame when exposed to oxygen. 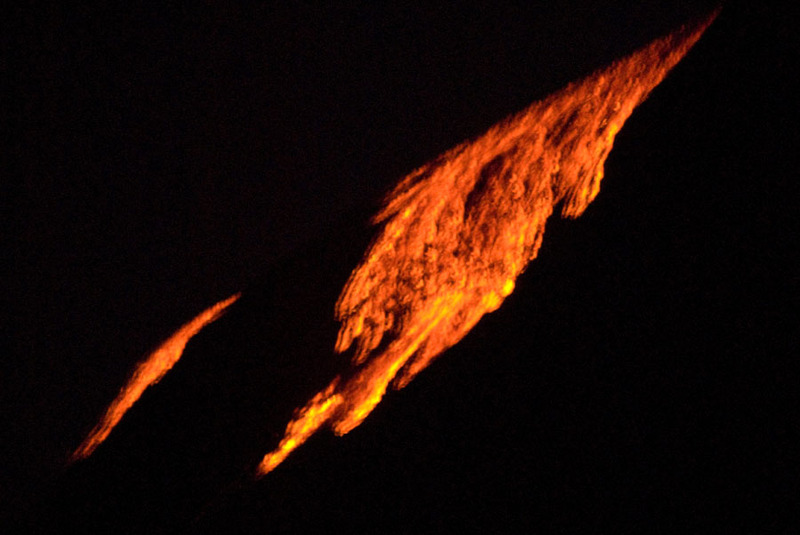 All we saw then was the remnant flowing lava-like, still red-hot slag, which you see in the final image. It was a fine fireworks ending for our 6-day trip. The double exposure effect here is due to the approximately one-second exposure my camera automatically made in this darkness. The slag by then looked quite dim to the naked eye at distance. 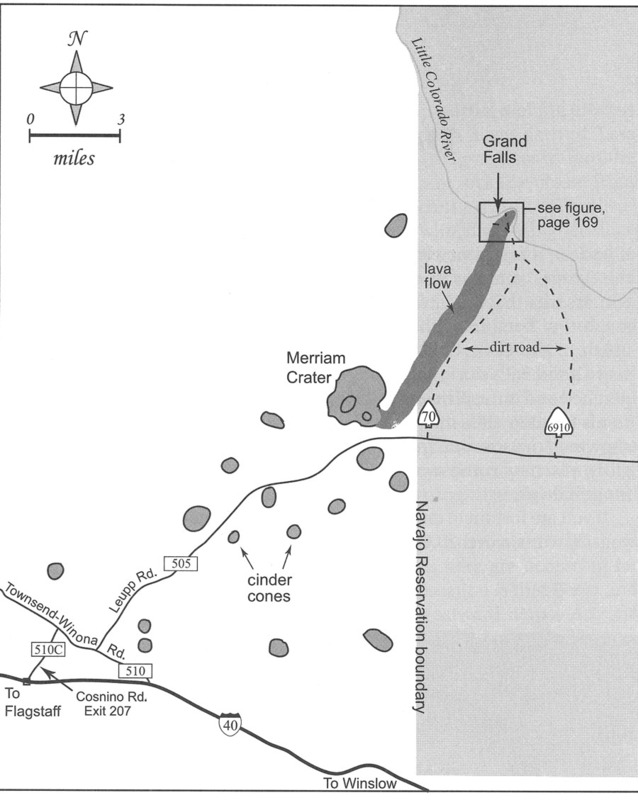 Abbott, Lon and Terri Cook, 2007, Geology Underfoot in Northern Arizona, Mountain Press. 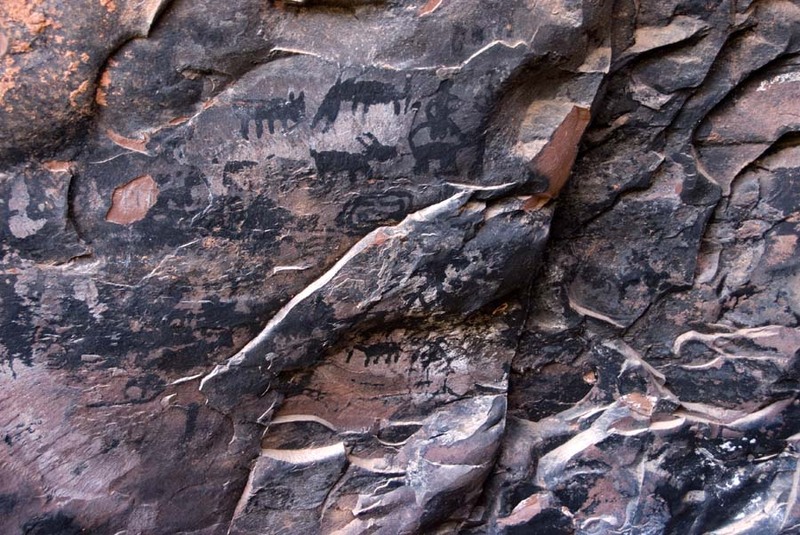 Blakey, Ron & Wayne Ranney, 2008, Ancient Landscapes of the Colorado Plateau, Grand Canyon Association. 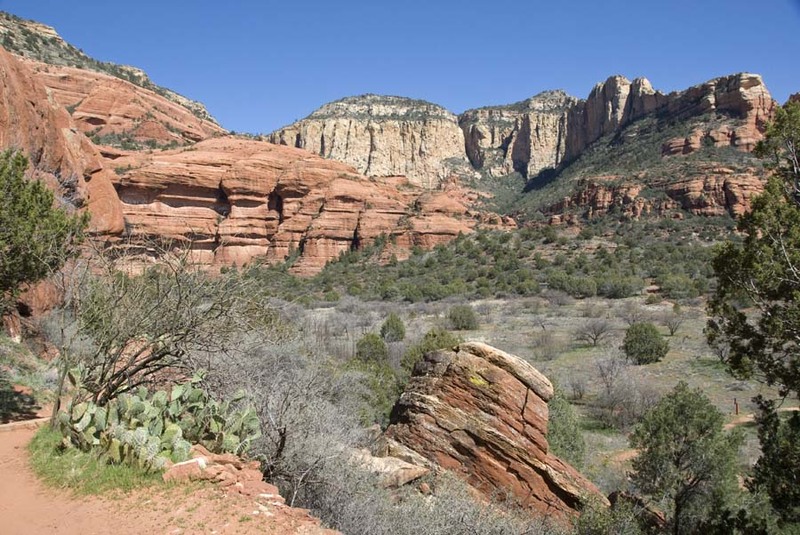 Ranney,Wayne, 2010, Sedona Through Time: A Guide to Sedona's Geology, P. Chan & Edward, Inc.